Is it just me or does everything “unicorn” seem to be the new fad lately? 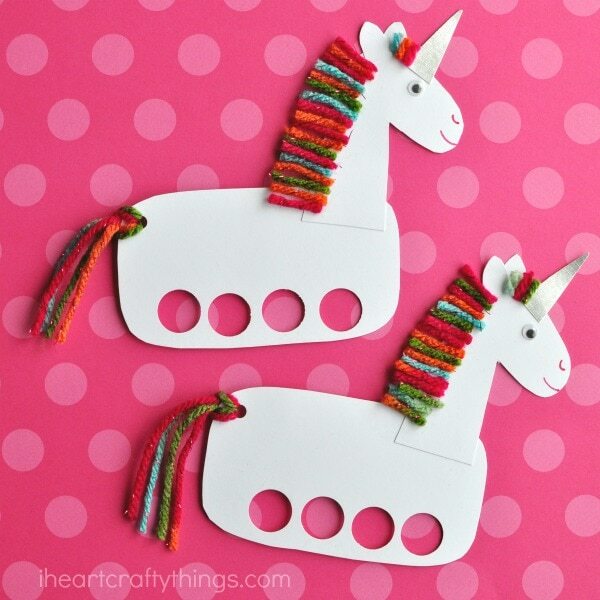 From darling unicorn crafts to beautiful cookies to unicorn poop in numerous fashions…Unicorns seem to be everywhere! Honestly, it doesn’t bother me one bit because I LOVE unicorns!! I mean, who doesn’t?! 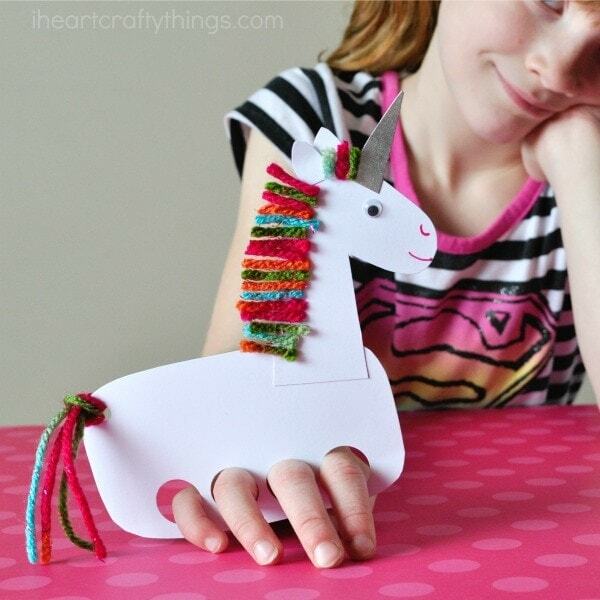 We couldn’t resist jumping on board the unicorn revolution so today we are showing you how to make these incredibly cute and playful unicorn puppets. Let me just say, you NEED one…or two…or maybe a whole herd because seriously, they are so much fun! 2. Punch four 3/4-inch holes in the bottom of the unicorn body with your circle punch. These are the puppet holes for your fingers. 3. Glue the unicorn head and neck onto the body. Then glue on your ears and unicorn horn. 4. Cut several small pieces of multi-colored yarn. Put a line of tacky glue along the back of the unicorn neck and right at the top of the head and glue on all of your yarn pieces. 5. 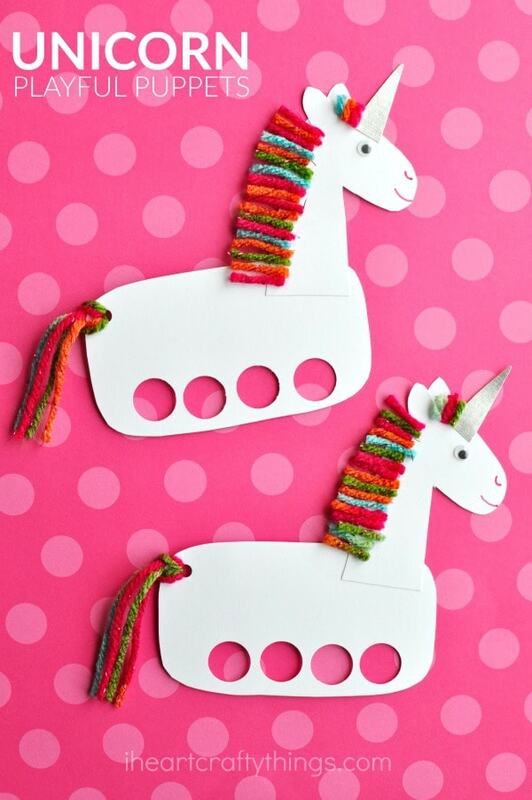 Punch out a hole at the end of the unicorn body with your hole punch so you can attach a tail. Cut a strand of yarn, probably about a foot long. I just cut it to a length where I had several different colors showing. Fold the piece of yarn in half. Thread the folded end of the yarn up through the tail hole so that you’ll have a loop. Thread the other end of the yarn through the loop and pull it closed tightly around the tail hole. See picture collage above for reference. Cut off any excess yarn at the end of the tail. 6. 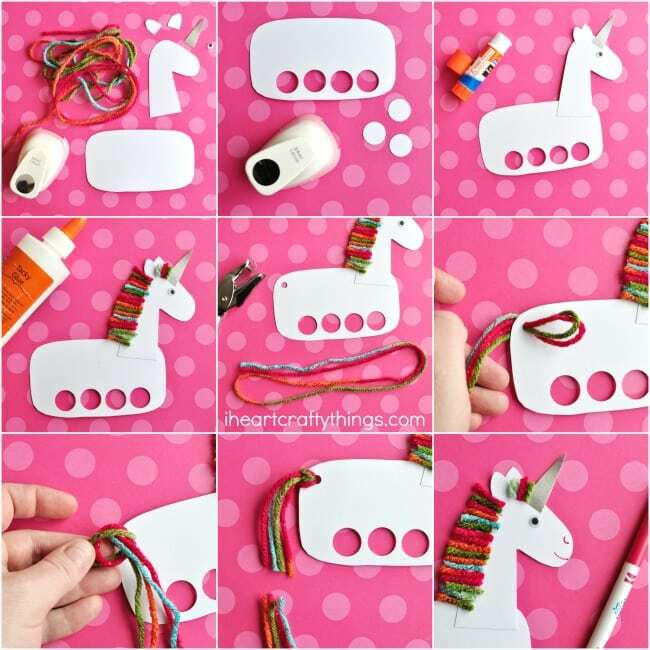 Finish your playful unicorn puppets by gluing on a googly eye and using your pink marker to draw a nostril and mouth on your unicorn. Now it’s time for play! 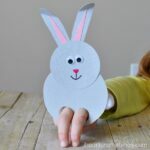 Place four fingers into the holes on the bottom of the unicorn body and gallop, gallop your gorgeous and magical unicorn puppets all over your house. See a short video of our pretty unicorns in action on our Facebook page. 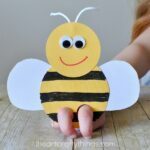 Check out more fun puppet crafts! Hi Herlina! If you subscribe to my newsletter I include a link to my subscriber freebie page each week where you can download the pattern. I have a box in my right sidebar where you can enter your email address to subscribe. Then you will receive an email to confirm your subscription. I have a newsletter coming out tonight at 8pm MST. Thanks! Thank you :).. I got the template :). I have entered my email to be able to access the template. I haven’t received an email confirmation and I’d like to work on them this morning. Thank you for your help! 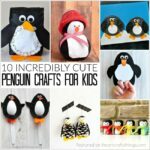 I love this article and I liked the DIY gifts. very helpful for gifting younger kids.